As we have since July 2006, each Friday we’ll post our sampling of cigar news and other items of interest from the week. Below is our latest, which is the 580th in the series. 1) On Monday, General Cigar announced a partnership between A.J. Fernandez, the Diesel cigar brand, and Rabbit Hole Bourbon. Those entities have teamed up to create Whiskey Row, a new cigar line featuring bourbon barrel-aged binder leaves from a “proprietary process” developed by Fernandez. This concept was “brought to life in 2016 when Rabbit Hole Bourbon barrels arrived at Tabalacera A.J. Fernandez in Esteli, Nicaragua,” reads a press release. “A.J. placed the Mexican San Andrés binder in the bourbon barrels in a special configuration. The tobacco was left to rest inside the barrels, and the amount of air inside was controlled at regular intervals to ensure the bourbon flavors were imparted evenly.” In addition to this binder, Diesel Whiskey Row includes an Ecuadorian Habano wrapper aged for five years and Nicaraguan filler tobaccos aged for five to eight years. 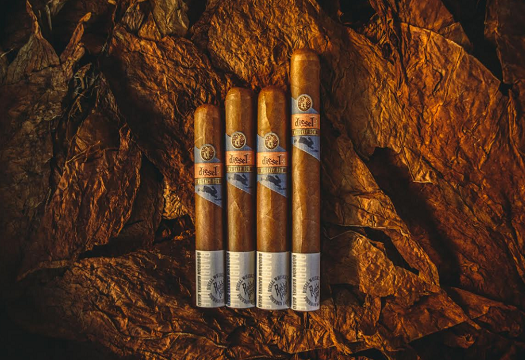 The blend, scheduled to launch next month, will be offered in four sizes, each packaged in 25-count boxes: Robusto (5.5 x 52, $7.49), Toro (6 x 54, $7.99), Churchill (7 x 49, $8.49), and Gigante (6 x 60, $8.99). 2) A date has been set to hear oral arguments in the lawsuit that pits premium cigar industry groups in Texas against the FDA. Judge Kimberly C. Priest Johnson of the U.S. District Court for the Eastern District of Texas will preside over the case. She bumped up the proceedings to begin on June 26 “in light of the August 10, 2018, effective date of the warning requirements.” She also denied the FDA’s request to move the case to the U.S. District Court for the District of Columbia—which is good news, since last week that court ruled against the cigar industry. This suit is brought by the Texas Cigar Merchants Association, El Cubano Cigars, and En Fuego Tobacco Shop and focuses entirely on premium cigars; the Washington suit was brought by the Cigar Association of America, International Premium Cigar & Pipe Retailers Association, and Cigar Rights of America and, in addition to premium cigars, also included pipes and machine-made cigars. 3) Random Read: If Sports Gambling is Legal, Where Does the Money Go? 4) Inside the Industry: TAA (Tobacconists’ Association of America) is a small group retailers celebrating its 50th anniversary this year. One of the perks of being a member is access to exclusive TAA blends created by cigar makers only for member tobacconists. This week, Tatuaje announced they are shipping their TAA 50th Anniverasry blend. This year’s Tatuaje TAA cigar is a robusto (5 x 52) that features a Connecticut Broadleaf wrapper around Nicaraguan binder and filler. Production is limited to 2,500 boxes of 20 cigars with each cigar selling for $11.95. 5) From the Archives: Back when we interviewed A.J. Fernandez in 2011, we started the interview by noting: “A.J. Fernandez may be the best cigar maker you haven’t heard of. But not for long.” You’ve probably heard of him now. 6) Deal of the Week: StogieGuys.com recommends Bespoke Post, a monthly collection of awesome items (think fine bar accessories, shaving kits, workout gear, and more) delivered for just $45. Of note is the Churchill box, which features four exclusive cigars, an ashtray made of reclaimed wood, an odor-eating candle, cedar spills, and a cutter. Once you are signed up, there is no obligation; you can skip or purchase each month. Sign up now to be eligible for the June box.